Anne going through the gate at the airport, crying. Bill sees Anne's plane taking off. He looks shattered. Bill is playing with a cricket ball. He misjudges and it lands on his head! He curls up in pain. Karl and Susan say it won't be too long before Anne comes back. He says it seems like forever and goes out. Karl tells Susan he's looking forward to the orienteering. She says he's too competitive. Karl insists that he isn't - he just wants to inflict a crushing defeat on Phil and Ruth that leaves them shattered individuals(!). Harold is marking out an orienteering map. Paul says he's not happy that Tad has invited himself on his trip. Madge tells him he'll have to tell Tad he can't come. Phil is looking at his electronic compass - he's convinced they're sure to win with it. Ruth is looking sad about Anne's departure. But Hannah will be coming home soon so at least the house won't be too empty. Tad is nagging Harold to give him a job. He says he has experience and everything. Paul comes in and Tad raves about going to Port Lincoln, so Paul doesn't tell him he can't come. Bill is trying to make a CD rack but can't concentrate. Tad is talking to his mum on the phone. 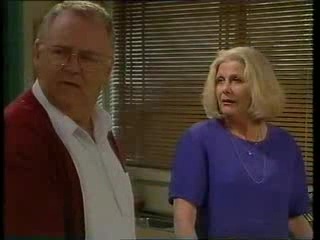 He tells her he's going to Port Lincoln with Paul for the holidays, much to Paul's consternation. After he's off the phone, Paul tells him he doesn't think there's enough room for him on the boat - due to health and safety reasons. Tad gets annoyed and tells Paul to stuff it - Paul never wanted him to come. Anne comes in with two suitcases. Bill thinks he's hallucinating. Anne says she couldn't leave him - she's not going to Dawber. She got off the plane in Sydney and turned around - he's her soulmate and she couldn't leave him. Bill is very pleased. Susan and Ruth are joking about the orienteering. Ruth says she's really missing Anne. At that moment Anne comes in with her cases. Harold is talking about the orienteering - he hopes it doesn't get too competitive. Paul is upset about Tad. Harold says he shouldn't have lied - he should have just said he wanted time alone with his dad. Ruth is cross that Anne has come home. Anne says she wants to be with Bill. Ruth says her and Bill might split up - they're only seventeen. Ruth says she's throwing away the opportunity of a lifetime. Anne says she'll go to university in Eden Hills. She storms out. 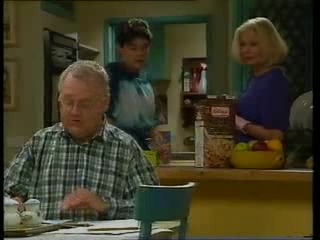 Madge comes round to talk to Tad about Paul. She tells him the real reason Paul doesn't want Tad to go to Port Lincoln - Paul's relationship with his father isn't easy and they need time alone together. Madge says he is doing a "tough guy" routine and couldn't tell Tad the real reason. Anne is upset that Ruth is angry. Bill says he's glad she came back. 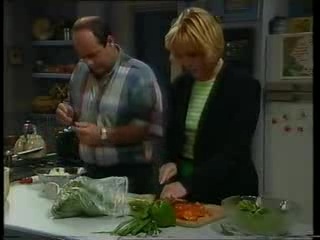 Ruth is angrily chopping tomatoes. Phil says that Anne really does love Bill. Anne comes in. She says she went down to Eden Hills University and she'll be allowed to enrol. Ruth isn't happy. Anne says she knows Ruth thinks her and Bill is a silly teenage crush but it isn't. Phil and Karl are gearing up for the orienteering and rubbing suncream on each other(!). Susan and Ruth are chatting about Anne. Ruth is still furious about the airfare money that was lost. 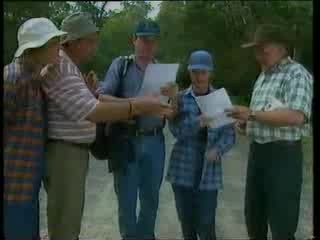 Harold hands out the maps. They leave on the orienteering trip. Tad and Paul have made up. Tad says that wanting to spend time with his father is nothing to be embarrassed about. Paul and Tad don't know how girls manage to talk about their feelings so much(!). Tad asks if Paul's dad feels like his real dad yet. He says he does a bit. Susan has taken the map off Karl because he's hopeless. She says he couldn't read a compass if his life depended on it(!). She finally agrees that he can have the map if she can have the compass. They glower at each other. Ruth falls down a bank and gets her foot stuck in a rock. The compass falls in the water. Ruth can't get her foot out.